Notes: The red color in the title Higurashi no Naku Koro ni is in fact an official component, but is not reproducible in some input fields of the database we are using. It is June 1983. Maebara Keiichi transfers to the rural town of Hinamizawa and meets his classmates: Rena, Mion, Rika, and Satoko. Everything seems tranquil; they spend their days playing games afterschool, and they look forward to the annual Watanagashi Festival to commemorate the local god, Oyashiro-sama. But this is no normal town. For the last four years, someone has been murdered, and another person has disappeared on the day of the festival. Keiichi and his friends are drawn inexorably into the events surrounding the great mystery of the town, and must figure out the truth before they are driven insane ... or worse. The first time I heard of this show, I had this series enthusiastically described to me as "Attack of the Killer Lolis". Needless to say, I was actually extremely leery of watching it, but as it came on the airing schedule for ASU's Japanese Media Society, I decided to try it anyway. Yeesh! I thought Elfen Lied and Gantz were brutal, but Higurashi seems even more gutwrenchingly violent, largely because of the seemingly incongruous characters and setting. Cuteness is not a buffer against an excruciating onscreen death, and the events quickly devolve into something vaguely resembling lemmings being herded into a giant blender. Not just once, but repeatedly, as the characters get to relive the events again and again until they solve the mystery. It's Groundhog Day as a light, fluffy dating sim that quite suddenly turns into a slasher flick. The effect can be horribly repellent, and I really can't recommend it to most people, but the strange thing is that Higurashi actually works at times, because the horror and suspense are just as often subtle as not. While the violence reaches a dizzying crescendo at the denouement of most of the story arcs, the path to get there is deliberately paced, and nothing seems done helter-skelter. Clues are given throughout the series as to what is really going on -- at times it feels downright clever. On the minus side, the art is simplistic and mediocre, with washed-out colors and terribly generic designs, though this may simply reflect the supposed "ordinariness" of the characters going through these traumatic events. The juxtaposition of harem romance tropes with the murder mystery theme often feels outright absurd, but it seems intentional, as opposed to the unintentional but equally creepy backdrops of Sister Princess and Final Approach. Fortunately for us (though perhaps not so much for the characters), Higurashi is far more murder mystery than harem romance. If that's what it takes to get obsessively crazy otaku watching something other than one-stupid-guy-herding-lots-of-stupider-girls, then maybe it's fine, but on the other hand, we probably don't want to be giving people ideas on torture methods to emulate ... Yikes! If you *like* violence, you'll undoubtedly like this show. However, if you consider violence to be secondary to a well-written plot, then you'll probably have to be extremely persistent and tolerant to make it all the way to the end, and even then you maybe won't feel satisfied. Higurashi is a hard show to watch; while it's interesting, each chapter is progressively soul-sucking and depressing, as the characters struggle desperately to avoid grisly fates, often to no avail, multiple times! While I assume from the source material that the end of the show gives us a final payoff, this is definitely a show where the journey is more important than the destination. UPDATE: After some years of rumination and letting time wear down the initial shock of the series, I've decided to revisit Higurashi and take a deeper look. It's still a tough pill to swallow, because this is still psychologically harsh stuff. The characters really get put through the wringer as they continually relive the events of June 1983, and any attempts at comedy are quickly snuffed out by the creeping, overwhelming sense of despair. However, each story arc is interesting because they play out so differently each time; it's also important to note that the narrative viewpoint isn't particularly reliable, which throws a real wrinkle into the whole storytelling process. There's a lot of delusional behavior portrayed, and it doesn't take long before the bathos gets overwhelming, even as tantalizing hints are left leading very slowly (perhaps too slowly for many) towards the truth of the matter. While I have grown to respect the time and care taken to craft these scenarios, I really had a hard time truly enjoying this series. Part of the problem is that this is in fact merely the first season of a multi-part franchise (the main timeline concluding with the 24-episode Higurashi Kai TV series), so limiting yourself to just this first season will not satisfy any wish for resolution. What's more is that the resets are too clean - the viewer knows full well what's going on so waiting two to three episodes for everyone else to catch up is frustrating and slows the pace to a crawl. Instead of feeling the suspense of wondering what was going to happen next, I found myself yelling at the characters to just get on with the Hinamizawa Syndrome stuff already, and that's not really a compliment to the director. Another problem for me was that the animation is often simply not great. There were times when the animation was actually bad enough to distract me from what was going on, with lots of speed lines and contorted facial expressions that seemed paradoxically funnier to me than horrific. The use of these now-infamous "Higurashi faces" (kind of like O Faces of Death) had the massively unfortunate side effect of taking away some of the emotional investment that horror series like these have to rely on to be successful. Animation was clearly not intended to be this franchise's strong suit, but there's something to be said for the desire to give this enough of a budget to look good: Higurashi is simply one of those series that deserves to look better than it actually does. While I commend Higurashi for refraining from falling into harem stereotypes and utterly subverting the moe aesthetic, and for having a focus on character victories (no matter how small) rather than simply gleefully jumping into bloody carnage (I'm talking to you, Another!!! ), the series does not truly complete its narrative with this season alone, and could have benefited from better editing and far less reliance on those infamous "Higurashi faces" to get the point across. 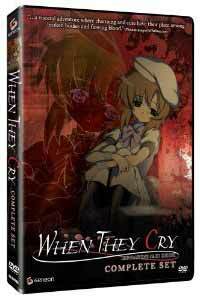 Still, as true horror-suspense anime are so few and far between (and most of them downright awful), this hit-and-miss series fills a rather large void in the anime library and deserves recognition for it.